If your day starts anything like mine, then you are up at 6 AM with a child that is full of energy and wants leche, muffins and cartoons. If your morning is a little bit more laid back, that’s great also. Regardless of how you wake up, everybody needs and can benefit from a good morning workout. Most of us don’t have a lot of time before we zoom out of the door, so a short but effective workout is just what the body and mind ordered. Jump-start your metabolism and get your body burning calories throughout the day. Clear the funk and cobwebs that may settle in the brain. Get your workout in early, and you’re done for the day. With a disciplined morning workout, there will be a noticeable difference in YOU: a pep in your step and a smile on your face! Here are 5 exercises to get you started. As you already know your Total Gym is all you need, so all that needs to happen is for YOU TO GET ON IT and give it your all. Level 3-4. Squat Stand or Toe Bar removed. Stand at the base of your glideboard facing away from the tower. Take a deep inhale and start rolling down (head, chest, belly button, hips). You are now in a deep forward bend. Place your hands on the glideboard and sit where your head would be on the board when you lie down. 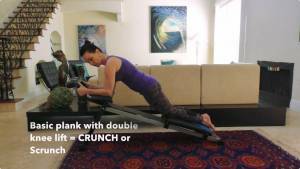 As you roll back onto the glideboard, start extending your legs. You are now in a straight line with arms above your head. Shoulders down, abs in and inner thighs engaged. Inhale. Start rolling up by lifting your head and arms. Exhale. Sink your ribs and roll the rest of the way up. Keep your arms at ear level and reach for your toes. Pull your abs in and up away from your legs, as if you were bending over a hot ball that you didn’t want to touch. Inhale and start from your lower abs to roll down. Exhale. Roll the rest of the way back down (still reaching the opposite of your roll down). Tips: Imagine you are in a body stocking. Everything is pulled together. When you are rolling up and down, resist pushing your abs out. Always strive to pull in towards your spine and up out of the crown of your head. Turn around and lie on your tummy placing your hands on the base of the glideboard with your chest hanging off the end. Your legs should be reaching for the tower. Inhale. Exhale, and extend your arms as you open the glideboard in a shoulder press. Inhale. Bend your elbows and push them towards the floor. On your next repetition, keep your arms extended, and as you close the glideboard, keep your arms straight. As you close the glideboard, start lifting your head, chest and belly button until your glideboard is closed and you are in an up dog position. Then go back to the shoulder press again until you have completed 8 shoulder presses and 4 up dogs. Tips: Just like a roll up, imagine you are in a body stocking. Everything is engaged and long. Keep your shoulders down so that you are not using your neck muscles. Reach the crown of your head away from the tips of your toes. Place your hands on the floor at the bottom of the Total Gym. Arms are shoulder-width apart and fingers are spread. Place your knees at the bottom of the glideboard. Flex your feet, placing your toes on the board. Inhale. Keep shoulders down, and keep a long neck. Exhale. Pull your abdominals in and up as you round your back in a cat stretch and lift your knees 1 inch of off the glideboard. Inhale. Extend your legs into a plank. Exhale. Contract your abs and bend your knees, closing the glideboard. Tips: Make sure to keep your upper body still. Only move from your lower ribs down. Think of your abdominals as a pair of brakes on a car and every time you bring your legs in, your abs are contracting to resist them. Kneeling at the bottom of the glideboard, place your hands on the floor in front of the base of the machine. Flex your feet and lift your knees off the glideboard just like knee stretches. Then, extend your legs into a plank position. Lift your left leg and bend your knee out to the side, bringing your knee towards your left arm. As you bend your right knee, and closing the glideboard, extend your left leg back into a plank but keep it off of the board. Repeat this motion 8 times. Tips: This exercise is just like knee stretches in how you hold your body to breath. Really try using your oblique muscles to get your leg high and to the side. At the end of your workout, kneel on the glideboard and bend back into a wheel pose, reaching for your heels and stretching the whole front side of your body. Place your feet on the floor at the base of the machine, stand, then go into a forward bend, and roll up to standing again. Try repeating the whole series 3 times! Don’t give up. Keep going, the power of the mind will get you through it when you think you can’t do it. Eventually, your body will get stronger and it will surprise you. Wake up, smile, workout, and get going! Men, beef up those chicken legs on the Total Gym!